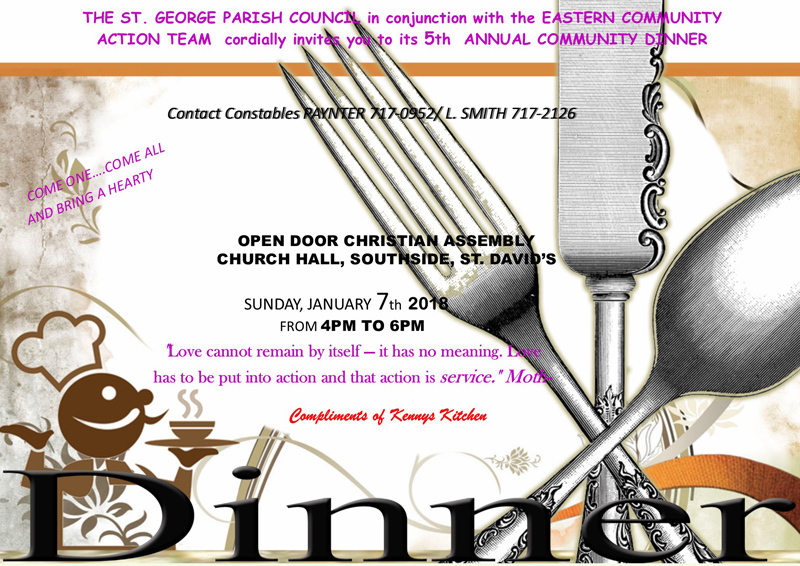 The St. George’s Parish Council in conjunction with the Eastern Community Action Team will be hosting their 5th annual Community Dinner on Sunday, January 7 at Open Doors Christian Assembly Church Hall, Southside, St. David’s from 4.00pm to 6.00pm. The event provides hot meals, including a dessert option, to members of the St. George’s and St. David’s communities that are able to attend the church hall – as well as a meal delivery service for those that can not. For more information contact Constables Paynter at 717-0952 or L. Smith at 717-2126.